Summary: Daniel Stashower, the two-time Edgar award–winning author of The Beautiful Cigar Girl, uncovers the riveting true story of the “Baltimore Plot,” an audacious conspiracy to assassinate Abraham Lincoln on the eve of the Civil War in THE HOUR OF PERIL. In February of 1861, just days before he assumed the presidency, Abraham Lincoln faced a “clear and fully-matured” threat of assassination as he traveled by train from Springfield to Washington for his inauguration. Over a period of thirteen days the legendary detective Allan Pinkerton worked feverishly to detect and thwart the plot, assisted by a captivating young widow named Kate Warne, America’s first female private eye. 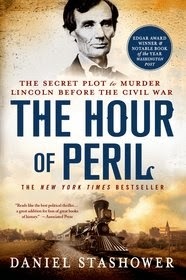 THE HOUR OF PERIL by Daniel Stashower is yet another Abraham Lincoln novel. This one tells the story about a secret plot to murder Lincoln before his March 4, 1861 inauguration as the sixteenth president of the United States. Lincoln’s team decided that Lincoln would make his way to Washington D.C. from Springfield, Illinois via a thirteen day train journey. The train would pass through only one slave state, Maryland, with a planned stop in Baltimore. Because of the slave versus free strife in the country and the fact that Baltimore was considered the center of secessionist conspiracies, the president of the Philadelphia, Wilmington and Baltimore Railroad hired Alan Pinkerton, the famous private detective to look into possible assassination plots along the route. Pinkerton focused his investigation in Baltimore and dispatched his best agents including Kate Warner, considered the first female professional detective. The investigation took the detectives from hotel rooms to saloons to brothels to railroad stations. The agents identified an assassination plot centered around a barber, Cypriano Ferrandini and his followers, known Lincoln haters. A parallel investigation led by General Winfield Scott also confirmed a possible plot to kill Lincoln. Based on this information Lincoln’s route to Washington was modified to avoid a stop in Baltimore. Lincoln was criticized by some for his “cowardly” act. THE HOUR OF PERIL is definitely a different type of Lincoln book. The main character of the novel is not Lincoln but Alan Pinkerton. The first one-third of the book is about Pinkerton and his detective agency. The final two-thirds focuses on the details of the investigation. Lincoln’s role is secondary but the reader gets a few snippets of Lincoln’s political views thorough his speeches at the planned train stops. The reader also gets a glimpse of Lincoln’s character as others try to convince him of the seriousness of the assassination plot. At that time and even today, there is controversy as to the significance of the assassinate threat. Some claim Pinkerton exaggerated the situation for his own benefit while others insist the threat was real. Like many other high profile assassination stories (the Kennedy assassination), there remain many unanswered questions. Was it a conspiracy of fifteen or of thousands? Did Pinkerton really save Lincoln’s life? Was it much ado about nothing? I would recommend this book to anyone interested in pre-Civil War history or to anyone who enjoys reading about Abraham Lincoln. You know how I feel about reading about that time period but I have to admit the part about Pinkerton sounds really interesting to me.